Our wizarding apprentice Judy was super helpful though we took no hints, her briefing and intro got us going. Our experience in the wizarding room went really well for a mixed group that some had escape room experience and some didn't. The room has cool tech and interactive puzzles. We had some really cool moments after solving them. You are the students of a wizard. Unfortunately, your teacher made a mistake during an experiment and became a soul without a body. You, his new students, need to put the little magic you've learned to use so you can save him before he completely disappears into the fourth dimension. 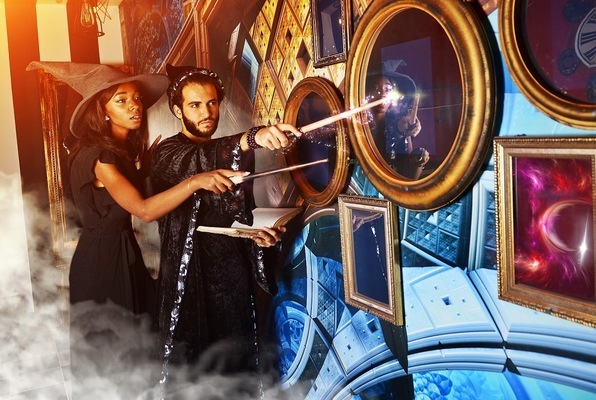 Reviews of escape game "Wizard's Workshop"
The Wizard room was really fun! This was our second time at an escape room - the first time for Mother's Day and this time for Father's Day! Since my family and I are mentally challenged at times with puzzle solving, Apprentice "Dan" was awesome and helped us make it out with just 3 seconds to go! I highly recommend this place! I went with a group of 5 to the Wizard's Workshop room. I enjoyed the variety of puzzles that had to be solved and the outcomes of solving each of the puzzles. There were some fun and unexpected surprises that kept things interesting and really motivated us to keep pushing ahead. I would definitely recommend 60out to anyone that is interested in trying an escape room for the first time. Judy, our game master, was great! She did a fantastic job orienting us on the ground rules, and also was great with giving us hints when we got stuck. Wow, this place was awesome! I've done three escape rooms so far at other places, but this is definitely my favorite! On Halloween, we showed up to do the Wizard's Workshop one, and we were running late, but Damien (who was totally awesome, by the way!) was super chill and flexible and set up the room great for us and got us really excited to do it! And man, was it fun! Really great quality puzzles that were solvable and logical, but still very challenging... Awesome design and theming, and Damien was attentive and enthusiastic and made it a great experience! We all agreed this was maybe our most fun Halloween we've ever had. Thanks guys, can't wait to try another one of your rooms soon! I've played around 10 escape rooms now, and the 3 rooms I've done with 60Out were amazing! I've played Titanic and Wizard Workshop at their Marina Del Rey location, and Mystery of Senator Payne at their West LA location. Titanic was a little easy, but a lot of the puzzles were really innovative and impressive. Wizard Workshop was a lot of fun, but it's the hardest of the three of done so far. Definitely save it for when you have a bit more experience with escape rooms. Parking at Marina is easy, there was a lot right next to the building that we were able to use.